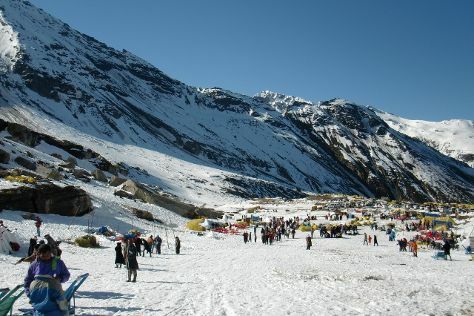 Your day-by-day itinerary now includes Rohtang Pass. On the 14th (Tue), head outdoors with Rohtang Pass. To find reviews, where to stay, traveler tips, and other tourist information, read Vashisht travel route tool . Hyderabad to Vashisht is an approximately 12.5-hour flight. You can also drive. Wrap up your sightseeing on the 15th (Wed) early enough to travel to Manali. On the 15th (Wed), witness a stunning natural landmark at Vashisht Baths, then contemplate the waterfront views at Beas River, and then contemplate in the serene atmosphere at Siyali Mahadev Temple. On the 16th (Thu), you'll have a packed day of sightseeing: take in the spiritual surroundings of Hidimba Devi Temple, admire the verdant scenery at Solang Valley, and then find something for the whole family at Himvalley Manali Amusement & Culture Park. To find photos, where to stay, more things to do, and more tourist information, read Manali tour itinerary planner . You can drive from Vashisht to Manali in 1.5 hours. Wrap up your sightseeing on the 16th (Thu) to allow time to drive to Shimla. Start off your visit on the 17th (Fri): admire the striking features of Viceregal Lodge, admire all the interesting features of Indian Institute of Advanced Study, take in the spiritual surroundings of Kali Bari Temple, then don't miss a visit to The Mall, and finally walk around Annandale Ground. To find traveler tips, photos, more things to do, and tourist information, you can read our Shimla trip planning website . Getting from Manali to Shimla by car takes about 4.5 hours. Other options: take a bus. Wrap up your sightseeing by early afternoon on the 18th (Sat) to allow time for travel back home.